When you talk about thrash metal, talk invariably goes towards either the Bay Area or German scene for where the true thrash originated. 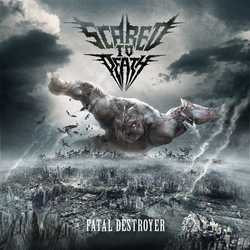 Scared To Death is a thrash trio from the Bavarian region of Germany and this is their second second full length CD and follow up to 2008's Deathstruction. Unfortunately I don't have the first album to go on to judge the band's growth in the six years in between releases, but I prefer to focus on the album at hand anyway. What we have here is some decent thrash, though nothing incredibly breath-taking or innovative (there seldom is much innovative in this genre). The production values are okay, but seem to be slightly muddled and not as rich sounding as some of their peers at this time, that may keep them from breaking out of the very heavy crowd of quality thrash bands that can be found these days. Without going into detail on if the thrash scene has a lot of life still left in it or not, but a band that plays that style of music needs to find a way to either break the trend or find make some really quality metal. Scared To Death have not gotten there yet, but they do not do any shame to the genre either. Songs such as Mind Invaders and Trail Of Death are very good. Manic Mullah is a nice fast paced thrash number with a bit of something different, so it definitely sticks out as one of the more interesting songs on the CD and Crew Of Vengeance is a real head bobber of a track. At this point you can really feel the band hitting their stride as the title track then comes in and scorches your eardrums with it's fiery attack. Battered is a real pit starter, definitely one of the tracks that will get the blood boiling and possibly the best track on the album. Overall a very solid effort, though still needing that little bit to make Scared To Death stand tall above the rest of the pack!